Three months ago, Jeremy Corbyn shocked the world when he was elected head of the Labour Party in Britain, becoming the country’s opposition leader, vowing to return the Labour Party to its socialist roots, championing the renationalization of public transportation, free university tuition, rent control and a national maximum wage to cap the salaries of high earners. 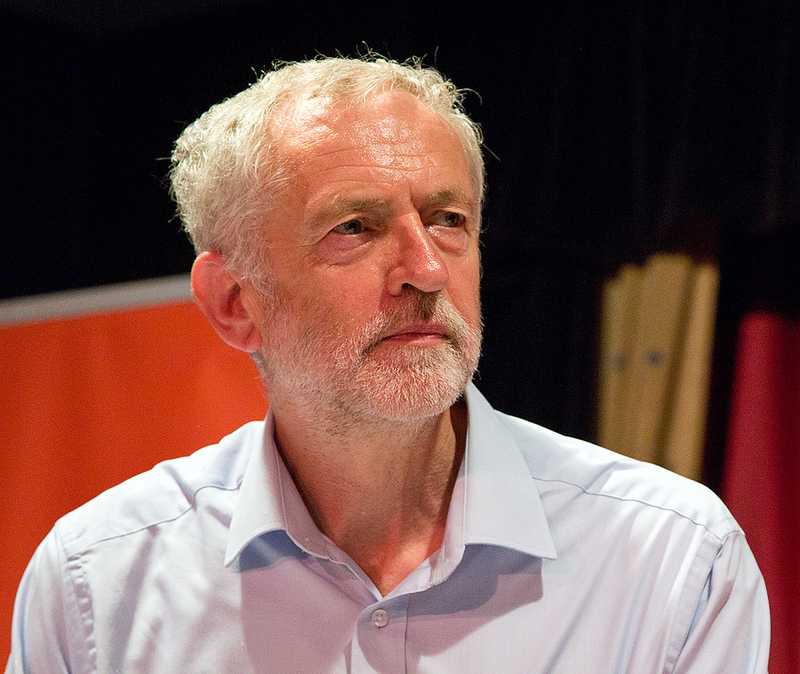 Corbyn has been a longtime antiwar activist who once chaired the Stop the War Coalition. Last week he voted against authorizing Prime Minister David Cameron to begin bombing Syria. A day before the vote, Cameron accused Corbyn of being a terrorist sympathizer for opposing airstrikes. At the U.N. climate summit in Paris, Amy Goodman sat down with Jeremy Corbyn in his first U.S. TV/radio interview since being elected Labour leader. He discusses why he opposed the bombing of Syria, his refusal to drop a nuclear bomb anywhere if he were prime minister, and his call to determine who is funding ISIL. AMY GOODMAN: We’re broadcasting live from COP21, the U.N. climate summit in Paris, France. Three months ago, Jeremy Corbyn shocked the world when he was elected head of the Labour Party in Britain, becoming the country’s opposition leader. Corbyn vowed to return the Labour Party to its socialist roots, championing the renationalization of public transportation, free university tuition, rent control and a national maximum wage to cap the salaries of high earners. Corbyn has been a longtime antiwar activist who once chaired the Stop the War Coalition. Well, last week, he led the charge to vote against authorizing British Prime Minister David Cameron to begin bombing Syria. A day before the vote, Cameron accused Corbyn of being a “terrorist sympathizer” for opposing airstrikes. I sat down with Jeremy Corbyn last night in Paris in his first U.S. TV/radio interview since being elected Labour leader. AMY GOODMAN: This is Democracy Now!, democracynow.org, The War and Peace Report. I’m Amy Goodman. We’re in Paris, France, with the head of the Labour Party of Britain, the opposition party in Britain. He was just elected a few months ago. Jeremy Corbyn, it’s great to have you with us. JEREMY CORBYN: Happy to be with you, Amy. AMY GOODMAN: So, how did you do it? JEREMY CORBYN: Well, we launched a campaign for the leadership of the Labour Party after the general election defeat in May. We were all—obviously, all very sad at losing the general election. And I felt that we lost for a number of reasons. One was that we weren’t offering a sufficiently radical alternative to the austerity agenda being put forward by the Conservative and Liberal Democratic government. And I was asked by colleagues in Parliament and a number of people outside if I was prepared to contest the leadership election. I did. Initially, we were completely written off by the media. I don’t know if you do gambling, but we were given odds of 200 to one. So it was a good investment. And we launched our campaign by taking part in public debates in Hastings and then traveling around the country. And we did a hundred events in different towns and cities all over Britain. And a lot of people came together—young, old, all groups, everybody. And the support grew, because what we were offering was an opening up of politics in Britain. And the result, you know: We won with 60 percent of the vote, the highest-ever vote cast in a party election in Britain. And the membership of the Labour Party has now reached 400,000, which has more than doubled in six months. So it’s been an interesting time. AMY GOODMAN: Now, you’ve just had a major vote that you lost, and it was around the bombing of Syria. You were opposed. Other members of your party were for and against. Your thoughts on what this means? And almost immediately, Britain started bombing Syria. JEREMY CORBYN: I’ve been in Parliament since 1983, and I’ve been involved in many issues over the time. Indeed, we first met when I was opposing the Iraq War in 2003. What happened in Paris was appalling, disgraceful, disgusting. And this afternoon I was at one of the cafés that was affected, and signed a remembrance book there. Is the response to that to start bombing Syria, or is the response to that to actually bring about and speed up a political dialogue, which at the end of the day is the only thing that’s going to bring about peace in Syria? I support the political dialogue, not the military intervention. I realized this was going to be a difficult issue in the British Parliament, a difficult issue within my own party. And I’m a leader, not a dictator. I want to persuade people rather than threaten or control them. And so I decided that I would allow all our members of Parliament a free vote on the subject—they can make up their own minds on it—and also consult the public. And so, what I did was wrote an email to all 400,000 of our party members, and we got a huge response, which was 75 percent against bombing. And I invited members of my parliamentary group—you’d call it a caucus—to vote against, and three-quarters—well, 60 percent—of them did, and a smaller number voted for the bombing. And of my own Shadow Cabinet, a majority voted against the bombing. And I hope this will be seen as a sign that the Labour Party is looking to peaceful solutions to the world’s problems. But above all, we’re going to hold our government to account. I know the vote went the way I didn’t want it to, and I know the bombing started a few hours later. AMY GOODMAN: What would a diplomatic solution look like? JEREMY CORBYN: A diplomatic solution would look like this. The Vienna process involves the Syrian government, all the neighboring governments—of Iran, of Iraq, of Turkey. It involves all of those—and Jordan, of course. In involves all the Gulf Cooperation Council countries. It involves Russia, involves the European Union. It involves the USA. It’s not going to be easy, any of this. But are we going to go into a proxy war between all those competing groups in already what is a four-way civil war in Syria, or can we bring enough of them together to get at least a ceasefire in the Syrian civil war and real isolation of ISIL for its money, for its arms and for the way it sells its oil? AMY GOODMAN: Talk about the role of Saudi Arabia. JEREMY CORBYN: Well, I’ve been concerned about the sale of weapons within the region, a massive sale of weapons to Saudi Arabia. And I’ve also raised, a number of occasions, the issue of human rights in Saudi Arabia. And indeed, in my speech to our annual party conference in Brighton in September, I raised the issue of a British prison contract that was being sought in Saudi Arabia and also the question of the death penalty on Mohammed al-Nimr, a young man who was guilty of nothing more than going to a protest. That speech and the brilliant work of many, many, many other people—not just me—helped to ensure that Britain withdrew from the prison contract. And an older man, a British prisoner, who was in prison in Saudi Arabia, has been released, and others have not been executed. We’ve got to keep up the pressure. But I’m also concerned about the issues of where the financial support for ISIL comes from. And so what I’ve done is asked our government, as indeed we ask all governments, look into your banks, look into your banking system. Who is laundering this money? Look at the manufacturers’ labels on those weapons that are used by ISIL. They didn’t all come from nowhere. Somebody’s been selling those weapons. But also, look at the question of how we treat communities across the world, so that we isolate ISIL for what it is, but we don’t blame people in the Muslim community or any other communities. Anti-Semitism, Islamophobia, racism are all part of the same degree of intolerance. We’ve got to oppose those and bring communities together. AMY GOODMAN: Jeremy Corbyn, Prime Minister David Cameron called you a “terrorist sympathizer” for opposing the airstrikes. You’ve demanded an apology. JEREMY CORBYN: He was asked many times to apologize. Indeed, I paused my own speech in Parliament to invite him, said, “Prime Minister, this is not a time for these kind of remarks. Can you please apologize now for it? Not just to me, but to all the people that maybe have the same kind of opinion that I do.” He declined to do so. People can judge for themselves. I want a world of peace. I’m not interested in bombs. I’m not interested in wars. I’m interested in peace. And I think it demeans his office to make remarks like that. AMY GOODMAN: You occupy the same position that Tony Blair once did—Tony Blair, the prime minister who issued a kind of culpa around Iraq, the invasion of Iraq, by saying that—well, let’s go to a clip. AMY GOODMAN: That was Tony Blair responding to Fareed Zakaria’s question on CNN whether in fact ISIS came out of the invasion of Iraq. Your response? JEREMY CORBYN: I thought it was interesting. I fundamentally disagreed with Tony Blair, when he was leader of my party and prime minister, on the question particularly of Iraq. And it’s interesting that in his interview on CNN he did say that one of the effects of the war in Iraq has been the growth of irrational forces like ISIL. Indeed, President Obama said something broadly similar about his thoughts on the long-term effects of what had happened in the whole region since Iraq. And I think we have to remember not just Afghanistan and Iraq, but also think of Libya. The West went in to bomb Libya to protect the people of Benghazi against an apparent immediate threat from the forces led by Colonel Gaddafi. They then went on to a bombing campaign across the whole country. All of the state infrastructure was destroyed. All the system of government was destroyed. And we now have a huge country which is dominated by a series of competing factions and is an ever-present problem for everyone in the region, for Tunisia and other countries around there. Again, it was Western policy that decided on that, just as much as Western policy after the invasion of Iraq in 2003 went on the de-Baathification policy, which actually destroyed all civil—normal civil structures of society, which have taken more than 10 years to rebuild, and they’re not rebuilt yet. AMY GOODMAN: According to The Independent, an unnamed general said the armed forces would stage a coup or mutiny if you became prime minister. JEREMY CORBYN: Well, I’ve asked for the source of this remark. None has been forthcoming. I have written to the secretary of state for defense to ask him to remind everyone that we live in a democracy, where members of Parliament are elected, from which government is formed, and that government is elected to run the country with a democratic mandate. It is up to all those that work in the public sector to recognize that democratic mandate. That includes generals. AMY GOODMAN: A lot of controversy around a BBC question whether you would drop a nuclear bomb, to which you said no. Can you expand on this? JEREMY CORBYN: Well, I’ve spent my life opposing nuclear weapons, and I was asked if I would be prepared to use nuclear weapons, and I gave the answer I think everybody expected me to give. And so, that is my view. AMY GOODMAN: How did it feel—for so many years you’ve been involved with the Stop the War Coalition, along with the late Tony Benn—that it was his son, Hilary Benn, who spoke out for the bombing of Syria in the Parliament? JEREMY CORBYN: Tony Benn and I were very close, very close friends for 30, 40 years. We talked to each other a great deal, and we were great friends. And I was with him shortly before he died, talking about prospects of the world and prospects for peace. And I’m very sad that he’s gone. He taught me a great deal. He taught an awful lot of other people a great deal. And he did something that I haven’t done: He kept a good diary of everything he did and learned from it. So, perhaps I should do the same. I don’t think one should ever start on the family connections one way or the other. Everybody makes their own mind up. Everybody makes their own decisions. And I would never involve myself in that sort of argument. Originally published at Democracy Now.